The kindness of strangers is at the heart of a new performance by Ata Dogruel. The Turkish artist is spending 28 days in silence, relying on his audience for food in what he describes as an invitation to care. 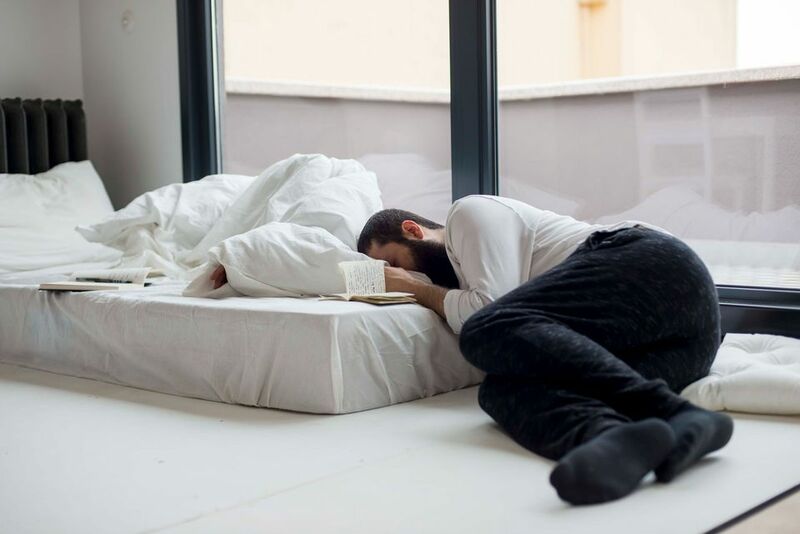 Dogruel is one of 10 artists in a marathon live show spanning 672 straight hours over a month, the longest-ever duration of performance art in Turkey. The event, titled Needed: You, features nine performances by members of Performistanbul, the country’s first international performance-art platform, and nearly 2,000 people have already attended the show ahead of its 16 March close. Works include Gülhatun Yildirim’s Inside, in which she precariously perches on a ledge outside of a window, confronting the relentless scrutiny. In Kala, Ozlem Unlu spends hours tethered to a throne, wrapped like a mummy in a plaster cast—an exploration on the limits of freedom and power. In Modesty, Dogruel rests in a room overlooking the Bosphorus Strait that is painted half in black and half in white. If he is hungry, he moves to the black side, where, he hopes, a guest will bring him his next meal and spoon it out to him. On a wall, he has etched a daily log, evoking a prison cell calendar, where he records his meals and the emotions they rouse within him. Dogruel’s gruelling performance alludes to the real-life hunger strike last year by two teachers in the capital Ankara who protested against what they saw as their wrongful dismissal. They were part of a government purge of 110,000 civil servants in the wake of a failed military coup in 2016. Writers, scholars and politicians are among the more than 50,000 people jailed during Turkey’s state of emergency. The teachers refused solid food for 324 days, spending much of the hunger strike in jail on terrorism-related charges, before aborting their protest in January without winning reinstatement. The length of the show poses other perils, namely to the artists’ health and security, and Burhanoglu consulted with doctors about the possible impact of psychological trauma. “The works present their own dangers to the artist, because they each become an object. They will not be the same people at the conclusion,” she says. The simultaneous performances in Needed: You sprawl across the six floors of an unrenovated 100-year-old apartment block in Istanbul’s historic Galata quarter. Burhanoglu founded Performistanbul in 2016 to bring together artists, develop projects and promote performance art, where the form has taken a back seat to visual arts and other disciplines such as theatre. She even eschews using the term “art” for the show in a bid to draw in neighbours from the working-class district. Later this year, the building will transform into a research space, the first of its kind for performance art in Turkey that Burhanoglu hopes will become a hub for artists and students. The space, which will house an archive, publishing imprint and accommodation for visiting artists, was donated by Burhanoglu’s family. Ticket proceeds from Needed: You go straight to stocking books in the centre’s planned library. Retaining its collectivist spirit, Performistanbul has shunned corporate sponsorship, the main source of support in Turkey, where the conservative government allocates few funds to the arts.